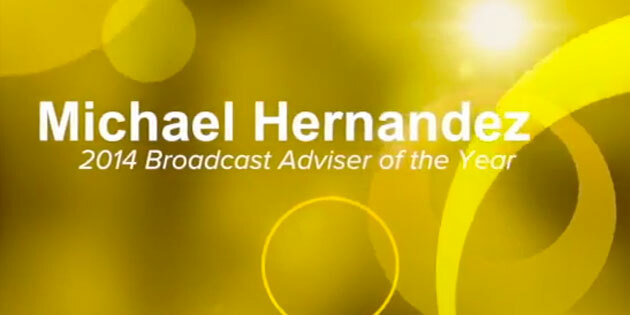 I’d like to start by thanking Lindenwood University for sponsoring this inaugural Broadcast Adviser of the Year Award. I’m truly humbled by the honor and hope to live up to the expectations that this award brings. I’d like to thank Kelly Furnas for coordinating this video and adding yet another item to the thousands of other details he has to take care of to make these conventions run like clockwork. I’d like to thank Mark Newton for his leadership and innovative spirit that has made all of us broadcast advisers feel welcome at JEA. I’d also like to thank Aaron Manfull, who’s become sort of a personal hero of mine. His work with the Digital Media Committee and digital media website continues to amaze all of us, and his integrity and professionalism has inspired me in my journey to become a better adviser. It’s because of Aaron’s continual efforts that we have finally have this Broadcast Adviser of the Year award. Thanks, Aaron. I’d especially like to thank Don Goble. Don has worked with me tirelessly for the past couple of years to develop broadcast seminars at the conventions, brainstorm ideas for the digital media website, and provide valuable perspective as we try to expand our support of advisers wanting to incorporate video and multimedia in their publications. Finally, I’d like to acknowledge all of my fellow broadcast advisers who strive to build rigorous journalism courses at their schools despite the many challenges. We know that they fight an uphill battle every day for recognition of their programs as legitimate classes, and that, no, their students are not the A-V department. My journey to become a broadcast journalism adviser has been a long and unusual one that began in a kitchen. I was about to finish graduate film school, and was saddled with debt. While I was passionate about filmmaking, I was less passionate about the prospect of working gig to gig as a PA for 10 years while I paid of my student loans. And then I found out about a school in Manhattan Beach that was looking for a teacher to start some kind of broadcasting film academy. Now, I really should have known better. Both of my parents are retired teachers, and two of my aunts and an uncle were teachers. So I knew first hand about the long hours of grading and prepping for classes. I heard the gripes about bad administrators, and even wore a button to elementary school in support of the teachers union when they went on strike. But I’d also seen the compassion my parents gave to their students, many of whom came from working class families. They talked about the satisfaction they got when field trips allowed their students to see the mountains or ocean for the first time, despite being only an hour or two away from home. I remember my dad buying track shoes for an athlete on his team because she couldn’t afford them. And to this day they still counsel former students whose parents aren’t around to help them. In college I’d had the opportunity to be a TA for film classes, and I enjoyed leading discussion sections. So when I had the chance to take a teaching job, it didn’t seem like such a bad idea. I would get a good paying job, pay off those loans, and work on my film projects during all the spare time teachers have, because, after all, what I really wanted to do was direct. This was all part of my five-year plan. Fifteen years ago this week, actually, I was hired by Mira Costa to develop curriculum and teach film and broadcast journalism classes the following fall semester. So I spent the rest of that spring and summer designing our media arts lab, ordering equipment, and figuring out what I was doing. Of course, our lab wasn’t ready for the start of school in September, so for the first two months I taught my classes in the only room available, an abandoned home-ec kitchen with stoves that leaked natural gas. We finally moved into our facility and I spent most weekends installing equipment, soldering cables, and trying to create lesson plans to stay one step ahead of my students. All that spare time I’d planned on evaporated and the reality of teaching set in. In May, we were finally ready to air our first newscast, live to the entire school. The kids had had a couple of months of training, and the gear was all functioning. The whole school was anxious to see what our first show would be like, and the skeptics were ready to pounce. The anchors were nervous, but the directors were relaxed. I won’t tell you exactly how it turned out, other than to give you this advice: telling your anchors that your live show is actually a rehearsal is a bad idea. It took a couple of years to recover from that first impression. But by then we were ready for our first real challenge. A vice principal confiscated a videotape recorded by our staff, that allegedly contained incriminating footage of the homecoming court starting a food fight. They wanted to use it as evidence to cite the students and possibly suspend them. My news director at the time was livid. So we both contacted the SPLC. He for how to proceed, and me for advice on how to stay out of it. By the end of the whole endeavor, the tape had been returned, my principal was incredibly mad at me, and the Mustang Morning News had become a real journalistic publication. As it turns out, the footage on that tape was useless–the videographer never got a clear shot of the action to begin with. Emboldened by our hard-won victory and new place at the journalism table, we strove to go even further with our work. But this has always been fraught with challenges. One the biggest obstacles faced by scholastic broadcast journalism is a perception of illegitimacy. And it’s mostly our own fault. We try to model ourselves on professionals who seem to have been pushed by market forces away from journalism and towards reality TV and melodrama. With the exception of NPR and shows like Frontline, it’s become increasingly difficult to find models of professional broadcasting to show my students that are also models of good journalism. So where can we turn for role models? I, for one, have turned to you. Your passion for telling truthful stories and bringing the First Amendment to life in your classes is remarkable, and a rich source of ideas that continues to inspire me and my students. From the passion and ‘why not’ attitude of Jack Kennedy to the thoughtful empowerment of his staff by Jon Reese, I’ve learned to question established notions of what an adviser is and what our staffs can accomplish. The knowledge and intellect of Frank Lomonte and the SPLC staff has provided the courage we need to be true stewards of the Fourth Estate. The point is that while we should look to professional journalists as models of what journalism is, we should also look to our talented peers as visionaries for what journalism can be. From newspapers, to websites and broadcast, from photographers and page designers, to videographers sound designers–we’re all journalists striving to tell the truth in as many ways as we can, to reach the broadest audience possible. With traditional journalism of all kinds disintegrating, it’s vital that we work together to forge the journalists of the future. We’re in an ideal situation to reinvent broadcast journalism, and aspire to higher standards than market forces have been able provide as of late. We have to redefine broadcast because we must, and because we can. This redefinition begins with understanding what we do, who we are, and how this fits into the purpose journalism. We know as journalists that it is vital to hear from all stakeholders, and we must be inclusive of diverse groups of students if we are to hear their stories, include their sensibilities, and truly embrace their life experiences which will enrich us all. We should think about the types of stories our students cover, and the people affected by those topics. Are we reaching outside of our comfort zone? Outside of our schools and neighborhoods? Are we truly giving our audience a broad perspective of how the world lives beyond our own experience? Let’s broaden the scope of our publications’ mission statements and challenge our staffs to cover diverse topics that matter not just to us, but to the people on the other side of town, or to those who practice a different religion than our own. Or maybe to those who speak a language other than English. It’s difficult for our students to make this stretch, particularly if they’re unfamiliar with the people or issues they hope to report about. This is where a diverse newsroom can help ease that tension, and expand the scope of our coverage. Let’s challenge ourselves as advisors to seek out those students and make them feel welcome on our staff. As we move into the future of journalism as a video and multimedia-rich profession, the low number of broadcast programs around the country, particularly in poor and minority-majority schools, will affect the prospects for these students to enter the journalism field, thereby impacting the diversity of professional journalists. The high cost of equipment exacerbates the problem. As advisers, we can reach out to our colleagues across town, and bring our students together for collaborative projects where we can share best practices. As an organization, we owe it to ourselves to address this issue through scholarships to conventions, and to coordinate foundations and other groups to create journalism incubators in parts of the country where they currently don’t exist. Consider how will this help expand our membership and the contributions these members can make to our own knowledge base. Maybe this all sounds a little too idealistic–and difficult–to become a reality. How will we ever find more time in the day to plan these things? And where will the money come from? But we signed on to do this when we became journalism advisers. I believe our mission is to encourage our students give voice to the voiceless and to make visible the invisible, no matter who the voiceless and invisible are. Maybe I feel this way because of my parents and their efforts to help their working-class students. Or maybe its because I always feel the need to root for the underdog. But I know that we can–and we should–do what we can so that the tide of scholastic journalism will help lift all boats. We owe it to the cause to make future journalists representative of our society and thereby make our democracy stronger.